If at the end of your run/walk you've prepared a mental grocery list, debated an issue at work or home, decided on the colour your going to paint your front door and so on.....then you're not present during your run/walk. If you're new to chi running/walking then you are also missing out on valuable practice time for the chi focuses which will help with your progress. By being present you relax, take in the surroundings (which are hopefully pleasant), engage with other runners/walkers and basically have fun and enjoy the time. So the way I stop my mind from rambling, distracting me from what I'm doing i.e. running/walking is use the Y'Chi. By using y'chi I keep totally focused ahead and while I'm focusing I remember to practice the chi technique, banishing all distracting thoughts which helps me to run/walk more efficiently. So the next time you're out for a run/walk and realise you're compiling a grocery list or whatever, use the y'chi, be present and notice the difference in your speed which will increase and your effort which will lessen. 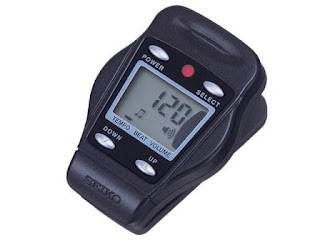 This simple little clip on Seiko Metronome is how you can work on your cadence level and gradually improve your time. Unfortunately I can't find any sports shops here in Cork selling them, but if you click here you can buy one online on the ChiLiving website and have it delivered to your door. Click here to go to my previous post explaining cadence for runners and walkers as this is a valuable tool not to be missed.